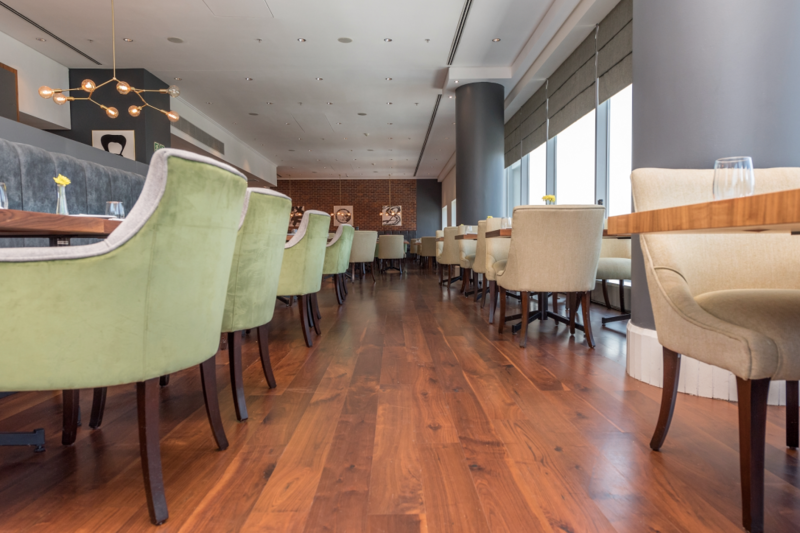 Engineered hardwood is becoming more popular in commercial flooring. FinOak wooden flooring from Finfloor meets the demands of today’s challenging commercial and residential spaces. The benefit of engineered flooring namely its ease of installation, lower cost and wide range of plank variations, helping designers and clients create warm and inviting interiors in offices, restaurants, conference rooms, retail shops, libraries and homes. The range is available in three species of thoughtfully harvested wood namely Oak, Jatoba (Brazilian cherry) and Walnut that are manufactured with a 2-5mm stable top face that yields a greater meterage of flooring than traditional solid timber from the same protected forests. As only a small slice of hardwood over high-quality plywood is used it is cheaper than solid wood. From the ultra-long, wide and thick 2.2m (2 200 x 300 x 15/4mm) planks to the versatile 1 210 x 192 x 10/2mm and herringbone planks, FinOak is available in planks to suit every project’s design requirements and budget. Easy to lay and fix together as compared to other flooring materials. A relatively lesser skilled labour and customers willing to install flooring themselves can complete installation. Wood flooring and cladding is designed with natural wood that enhances the aesthetics of the interiors in which it is installed and offers a high degree of versatility. As a preferred Rubio Monocoat oiling partner, Finfloor can finish the planks in over 60 colours. Damaged planks can easily be replaced if installed using a click system and the surface can be sanded and refinished up to 3 times. All FinOak products come with a limited 25-year manufacturer’s warranty, which covers any manufacturing defects including chipping, peeling and warping. All of the products, workmanship and service agreements are in line with the Southern Africa Wood, Laminate & Flooring Association’s (SAWLFA) expected standards in the industry. Finfloor also offers a service resolution through SAWLFA accreditation, participation and membership. Finfloor has a proven track record, 23 years’ experience and knowledge, as well as a long-standing relationship with, and commitment to the flooring industry in South Africa. For more information, contact Finfloor on info@finfloor.co.za or via www.finfloor.co.za.